Stephanie Stein is the mastermind behind egg-free baking at the Happy Girl Kitchen Co. in Pacific Grove. Because of her, fresh blueberry scones are now a breakfast staple at our house. Not only is she an incredible baker, her creativity and approach to baking inspires any novice to experiment and bake with her instincts. Using Stephanie's basic scone recipe, I made a few alterations to make it dairy-free, and tried out my interpretation of a coconut chocolate chocolate chip scone. 1. Add all of the dry ingredients (all the flours, sugar, cocoa, baking soda, baking powder, and salt) except for the rolled oats. Combine. 2. Work in chilled Earth Balance using a pastry cutter or your hands. Should resemble small pebbles. Don't overwork the dough. 3. Next, stir in the oats. 4. Add in chocolate chips and shredded coconut. 5. 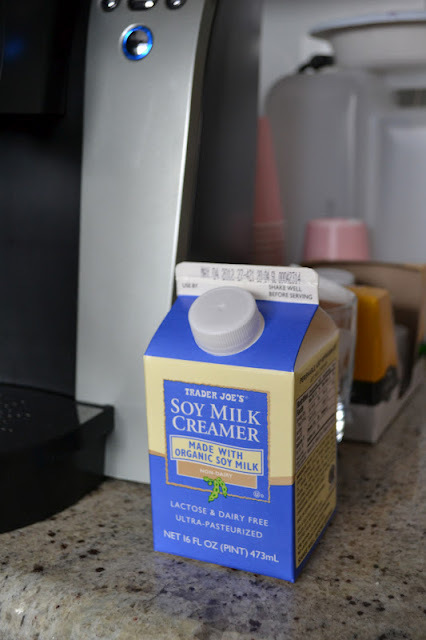 Pour in the soy milk and apple cider vinegar mixture, and the vanilla extract, and combine with your hands. 6. Cut dough into two even pieces and flatten them so they form 2 round discs, each 2" high. Sprinkle with sugar and cut into 6 wedges. 7. Place on parchment lined baking tray, and bake 18-25 minutes. They will be sturdy on the outside but still soft on the inside. These scones provide a wonderful chocolate fix, any time of day. The crunchiness of the oats and coconut, with a crisp outside and moist and gooey inside is the perfect balance. Any chocoholic's dream! This was hands down the fan favorite at Addi's birthday party. My stepdad made it, and everyone's been bugging me for the recipe since. 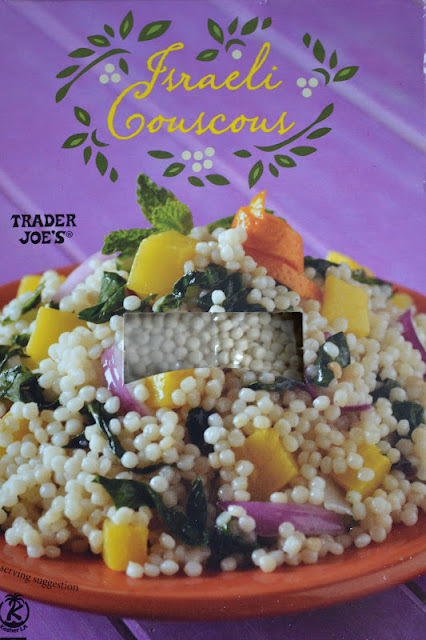 As he happens to be a chef, in true chef style there is no real recipe, but I will give you a simple guideline that you can use as a basis to make your own couscous salad. The first thing to note is that he used Isreali couscous, which can be found at Trader Joe's in a purple box, and is made of wheat. If you have gluten allergies, the same type of salad can be made with quinoa instead. 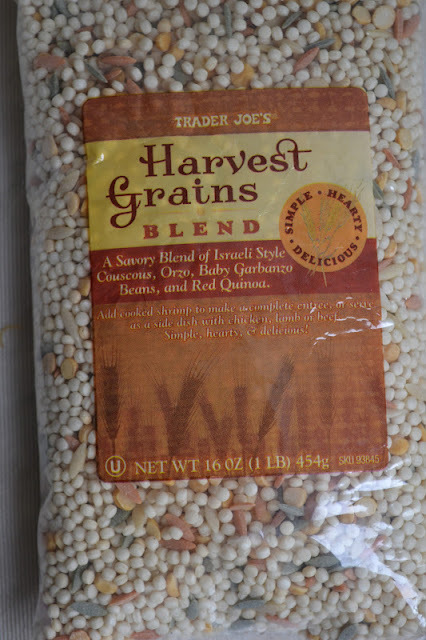 If you enjoy the taste and texture of Isreali couscous, I recommend experimenting with Trader Joe's Harvest Grains Blend, which is a dry mixture of Isreali couscous, orzo, baby garbanzo beans, and red quinoa. What I really love about this type of salad is that you can make it with any veggies you have on hand, and add fish, meat, shrimp, tofu, or any other allergy-safe proteins that work for you family. 1. Cook couscous according to package (you will first brown in a bit of olive oil for about five minutes, then slowly add boiling water until absorbed). 2. While the couscous is cooking, saute the onion and celery for a few minutes in a bit of olive oil, and season with salt, pepper, and garlic powder (or fresh garlic). Add red pepper and saute a few more minutes. 3. To serve cold, cool couscous and veggies first, then mix together, and season to taste if necessary. Add edamame and olive oil, toss, and serve. This is one of those rare dishes that is loved by both kids and adults. I happen to prefer it cold as a salad, and serve it hot for the kids. Enjoy! Being a Southern California native, I grew up a "Laker girl" so to speak. Magic, Worthy, Kareem, the Coop, Byron Scott, Kobe, even Rambis -- they were all heroes in my eyes. I loved the rivalry between the Lakers and Celtics, and later the Bulls and whoever else challenged the Lakers' dominance. So you would think that when I went to Cal for college, my love of basketball would have resulted in me attending some Cal men's basketball games. Nope. Not even one. I guess being out of a household of rabid fans and in a new city with so much to do, see, study, and eat will do that to a girl. This all changed last New Year's Eve. With excitement over Coach Mike Montgomery's leadership and discount tickets in hand, I finally went to my first college basketball game after nearly two decades of Cal fandom! Creating die-hard fans of the alma mater -- gotta start while they're young! I of course went with my fellow Cal devotees, my husband and two sons. With a 1pm start time, we would need to eat lunch before the game. As a mom of kids with milk,k peanut, and tree nut allergies, playing it by ear is never an option. I envision the day's schedule and to know what meals we'll be eating away from home and what snacks to bring in case we are out longer than we think. Figuring out what to do for lunch demands a bit of planning with online research, phone calls, and at-home food preparation in case any "safe" restaurant choices can't be identified. With my boys being severely allergic to dairy and various nuts including peanuts, I began looking for lunch options on Yelp. First I searched for vegan restaurants so I could eliminate dairy as a possible cross contaminant. You would think that this would narrow down the field but, in a socially-conscious community search as Berkeley, this still left a good number of places to explore! However, the fact that I was looking for a business that opened on Sundays quickly weeded out more potential eating spots. I decided to check out the website for Nature's Express, a restaurant on North Berkeley's hip Solano Avenue which likens itself to fast but healthy food. The website was promising. The menu offers burgers made with lentils or black beans, soy products such as tofu or seitan, and wraps with leafy greens and quinoa. As its cheese substitute, Nature's Express uses Daiya Vegan Shreds which is free of the top 8 food allergens. Although with a detailed description of its menu items, the website has a link to allergen information for all menu items aside from drinks. The company also has added links to menus especially for wheat-sensitive, soy-sensitive, and meat-loving customers. It is important to note that Nature's Express does serve nut products including an almond sunflower patty and walnuts and peanut dressing in a couple of its salads and wraps. If nuts are something that you must avoid, do give the restaurant a call for more information on their measures to prevent against cross contamination. We had planned to see a friend before the game so we decided to meet at Nature's Express at 10:30am, right when the restaurant opened. Getting to the restaurant at the earliest time was important to me because this was the best chance for me to have my kids' food prepared on clean work and cooking surfaces thereby lowering the risk of cross contact. Plus, I got to talk directly with the store manager who confidently answered all my questions about food preparation and cleaning practices. So yes, we ordered burgers at 10:30am, less than two hours after we had eaten breakfast...but we ate without any allergy incidents! We ordered two Cheezy Mushroom Chik-un Melts on a wheat bun, the Classic Grilled Reuben on rye, a grilled Daiya cheese, and a side of air-baked sweet potato fries. The grilled cheese was nothing to write home about. I think it would have been better with more Earth Balance vegan margarine on the bread to get a nice toasted, buttery taste. The sweet potato fries were okay, a nice change of pace from regular guilt-ridden fries. The Reuben was an indulgent experience. Made with marinated tempeh, it had all the rich tang of the real sandwich. The thousand island dressing was spot-on and the sandwich oozed of melted Daiya and dressing. I have to admit, I felt fairy gross after eating it because it was a gigantic, rich sandwich and I had already helped myself to a good portion of one of the chick-un melts. Definitely didn't mirror the healthy eating experience that I should have been having! 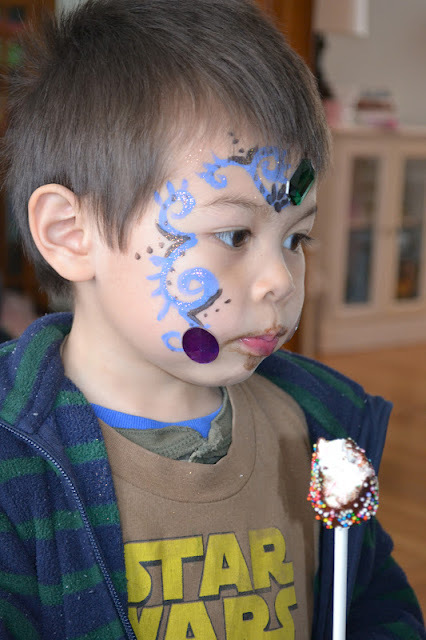 My poor kids were frightened by the mess and didn't want to give it a try. The Cheezy Mushroom Chik-Un Melt was the favorite of mine and my husband. My husband, who is not a fan of garden burgers, liked this melt. What's not to love? A patty that is crispy on the outside but juicy on the inside with grilled mushrooms, fresh lettuce, tomatoes, and onions on a toasted bun slathered with melted Daiya cheese. The Chick-Un Melt had the right amount of veggies and tomatoes to balance the burger. Nature's Express strives to create zero landfill waste by only using compostable containers and cutlery or selling recyclables such as glass-bottled juices. The restaurant didn't have a trash can -- now that's commitment! (Nice statement although I had to pocket my plastic safety wrap from the bottled coconut water I had purchased.) Indoor seating for Nature's Express is fairly limited. There are four tables including one large rectangle. There are a couple of tables for outdoor seating which would be perfect for those gorgeous, lazy Sundays for people-watchers. A bookshelf displays vegan cookbooks and information on veganism that patrons can browse and buy. If you are in the Berkeley area with a car (sorry, Solano Avenue isn't walkable from campus) and you have egg and/or dairy allergies, I recommend checking out Nature's Express. If you are also nut-allergic eaters, definitely consider getting to the restaurant when it first opens to avoid cross contamination on the grill. I can't wait to go back to try out other menu items including their avocado kale wrap and veggie juice blends. It's been a whirlwind of a week, beginning on a plane home from a blissful visit to Maui for a fabulous backyard wedding, and ending in our flat overflowing with pink, and primed for a mob of kids who had endured a rained-out week and were ready to party. All for our little princess, one year older, sassier, more opinionated, even more insightful. So many blessings! I wanted to keep it simple and have Addi's "Princess & Prince Party" at home with family and a few close friends, some pink decorations (by royal command), and a simple menu. "Simple," the way Martha Stewart makes a 27-step tiered chocolate ganache wedding cake decorated perfectly with flowers from her own garden. Only because the longer I ponder or gather inspiration, the more ideas I get and want to execute. Eventually I have 15 simple ideas otherwise known as a long list of tasks that need to get done on a ridiculous deadline. And that is how you end up in the ER the morning before the big day. "You almost sliced the entire tip of your thumb off, didn't you?" the ER doc said to me with a smile. "Don't worry, we can save this one." In retrospect, I would've loved to see my face when he said that. He ended up taking excellent care of me, and the three hours spent in the hospital gave me a bunch of time to not only finish my overdue library book, but think about how I needed to pare down and enlist more help to get through the party prep if I wanted to keep the rest of my fingers intact, as I still had a ton of veggie chopping to do. So three hours behind in my preparations, I took a few items off the menu, stopped tweaking the decor, delegated family with some of the baking and cooking, secured a few extra hands the morning of the party, and made sure grandma and grandpa could babysit the kids the morning before the party. 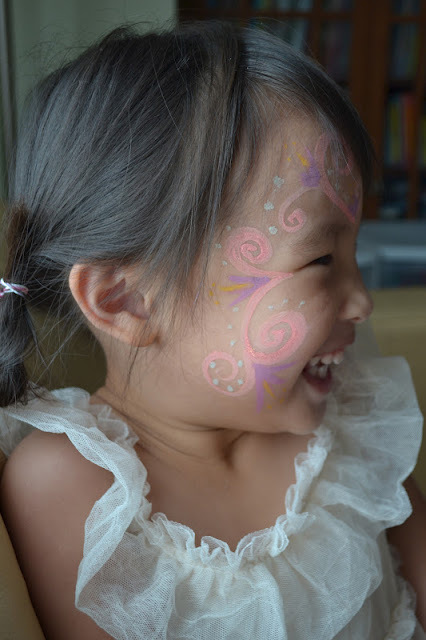 So here it is--a kid and adult friendly, dairy, egg, and nut free party with vegan options, dressed in pink, with a few simple yet satisfying dessert additions for my littlest one with the world's biggest sweet tooth. Enjoy! 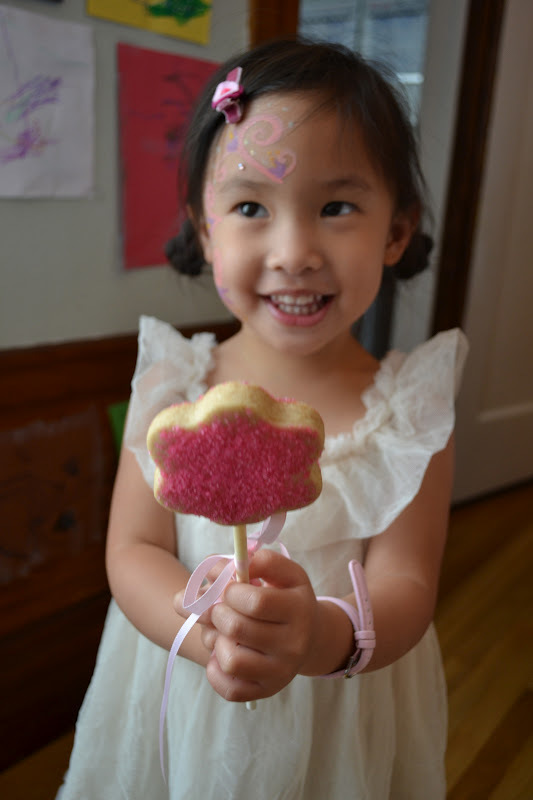 Addi was delighted by her pink cookie wand! I baked a few batches of our vegan shortbread cookies about 1/2 to 5/8" thick, added pink sprinkles, and baked them at 300 F for 45 minutes with cake pop sticks. They added a nice splash of pink. Our princes were equally excited by the royal affair! 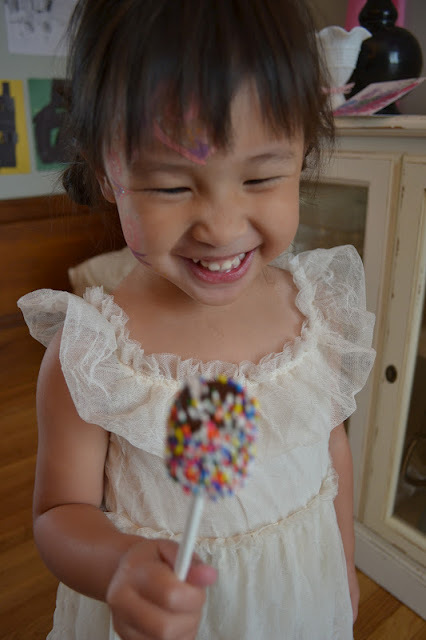 With the extra cake pop sticks, I skewered marshmallows, dipped them in melted dairy-free TJ's semisweet chocolate chips mixed with shortening, added sprinkles, and set them in the fridge for about 20 minutes. The kids gobbled them up. Irene had to cut off Callan after his third! Chocolate Wacky Cake cupcakes with cream cheese frosting were the birthday girl's wish! We had quite a spread, thanks to all of our helping hands! 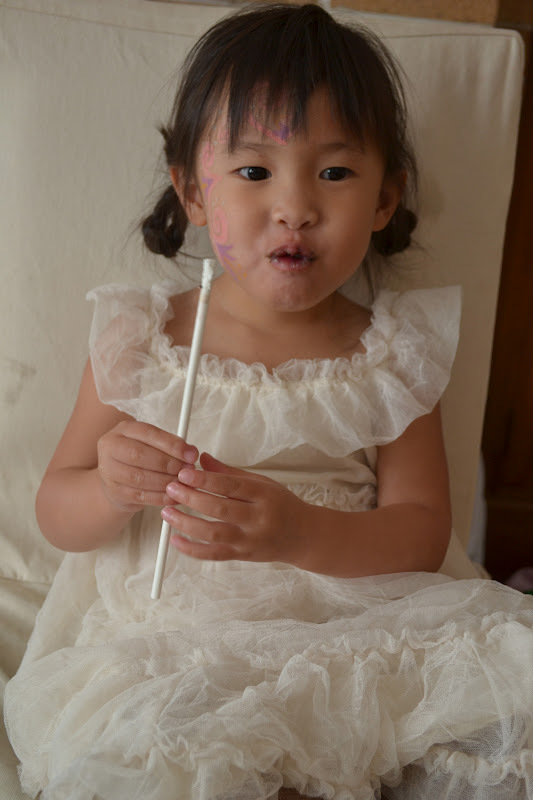 Cinderella swept in on our party, presented a story, sang, performed magic, and painted happy little faces. 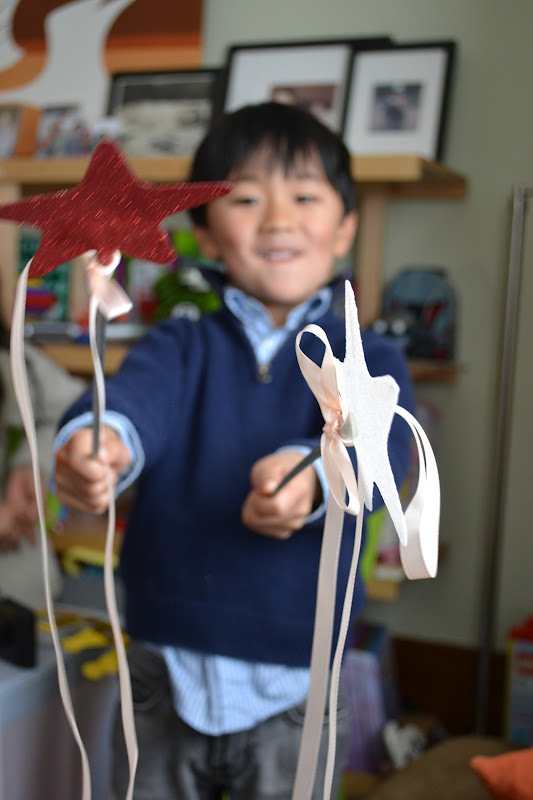 There are still more dishes to put away, gifts to open, and thank you cards to write, but I'm not stressing--I love how the memories of the day linger on. Happy Birthday little one! May you always remember the magic of your third birthday! I recently discovered Jules Gluten Free, a blog that is dedicated to gluten-free baking. Jules E. Dowler Shepard has been baking and sharing her gluten-free, allergy-friendly creations for years. Her lengthy experience with living gluten-free has led her to develop her own line of products including her special gluten-free flour and cookbooks. Jules created a gluten-free Tagalong recipe with vegan option. Looked promising! I used my go-to homemade gluten-free flour blend for the cookie instead of Jules' signature flour. The original recipe included what I thought would be a very large quantity of peanut butter (in my case, sun butter) filling. For my attempt at recreating her recipe I only made a half-batch of the filling. By the end of making and sampling the finished product, I wished I had made just a bit more to balance out the cookie and chocolate. So in my recipe below, I've adjusted the quantity so that it's 2/3 of Jules' recipe, which sounds about right to me. If you work exclusively from home, have sons not daughters, and do all your grocery shopping online, you may not have realized that we are in the midst of Girl Scout Cookies season! Cheery young ladies and their proud parents have armloads of boxes ready to bestow upon hungry and generous (remember, they're like $3.50 a box now...) cookie lovers everywhere. In front of markets, at sporting events, right in your office, you can hardly escape the delicious morsels...but, if you're a regular reader, you probably have to due to food allergies. As I mentioned last week when I posted a recipe for vegan, gluten-free lasagna, I think I have developed an intolerance to gluten. I seem to be able to tolerate some but I'm not sure exactly how much. The fear of being sidelined on the couch with abdominal pain is real enough that I'm trying to phase out most wheat products from my cooking and baking. Last year I posted a dairy-free, egg-free, nut-free Thin Mint recipe with soy-free options. This month I tried taking out the wheat flour. I made a simple substitution of gluten-free flour blend and xantham gum in place of the white whole wheat flour. I'm happy to report that it seemed to work out just fine! Here is one of many possible ways to substitute gluten-free, wheat-free flour in place of wheat-based flour for your baking needs. Cybele Pascal has this blend in her Allergen-Free Baker's Handbook and I have seen the blend in other GF cookbooks and other online sites. I have tried this blend in quick breads, muffins, cakes, biscuits, scones, and cookies so far with pretty good results. I tried this mix to make cinnamon rolls and the results weren't so good so I need to do a little more R & D to figure out what a good GF flour blend is for yeast-dependent baking. When I made cupcakes with this blend, they did come out pretty dense and got even more heavy after a couple days of refrigeration. Best to consume or freeze these within a day or two, I think! Xantham gum or guar gum is absolutely critical when you are using gluten-free flour so do not skip this ingredient. Xanthan gum (which contains corn derivatives) and guar gum replace the binding power that a gluten-full wheat flour source would provide. Xantham gum and guar gum are not cheap but a 1-pound bag of the stuff lasts quite a while since recipes typically call for 1 teaspoon or less per batch. Thoroughly mix flour and starches together using a whisk or sifter. Make sure you scrape the sides repeatedly so that all the ingredients are combined well. You may want to double the recipe so that you have a good-sized stash of GF flour blend for your future baking needs. Store in an airtight container in a cool place (you can even store in the refrigerator) for optimum shelf life. A delicious pasta dish without the wheat or gluten! There's nothing like a hot pan of lasagna to welcome you in from the cold! I hadn't made lasagna for a long time since we have been dairy-free for my kids' allergies. A couple years ago I had made some tofu lasagna but it tasted too much like tofu to merit making again. I'm really excited to tell you that my recent success with vegan quiche and frittata has given me new hope! Dairy-free ricotta cheese is pretty hard to find. Tofutti makes one that I tried recently but just as soon as it was available it seemed to disappear! No worries though. It was expensive and had a super long ingredient list -- lots of processing. Ricotta has a fairly mild taste so it was actually not too difficult to create a tofu substitute with a comparable texture and taste. I used the combination of nutritional yeast, firm tofu, cornstarch, and soy milk -- same combo that I used for the Swiss chard frittata -- and liked the results. One recent life development that could potentially derail my quest for a safe lasagna is that I have developed a mild intolerance to gluten. I haven't taken any tests but have observed my symptoms and eating habits over the past few months. I know for certain that if I eat a lot of bread, a few hours later I am buckled over with abdominal cramps and bathroom issues. I get super tired -- not sure if it's from the physical stress of dealing with abdominal pain or it's sluggishness as a result of the gluten. Either way, it's no fun and I've almost completely eliminated gluten and wheat products from my diet. After publishing my post on how to do a class presentation on food allergies, I was contacted by an allergy advocate and author from Ontario, Canada, who had taken notice of my post. She introduced herself to me as a mom who has a food-allergic son just like myself and informed me that she has been doing classroom presentations ever since 1995! Her name is Diana Brock and she is the author of The Best Audience which was published last year. Diana's peanut-allergic son Evan, who illustrated the book with older brother David, is now in college and lives away from home where he successfully manages his food allergies on his own.